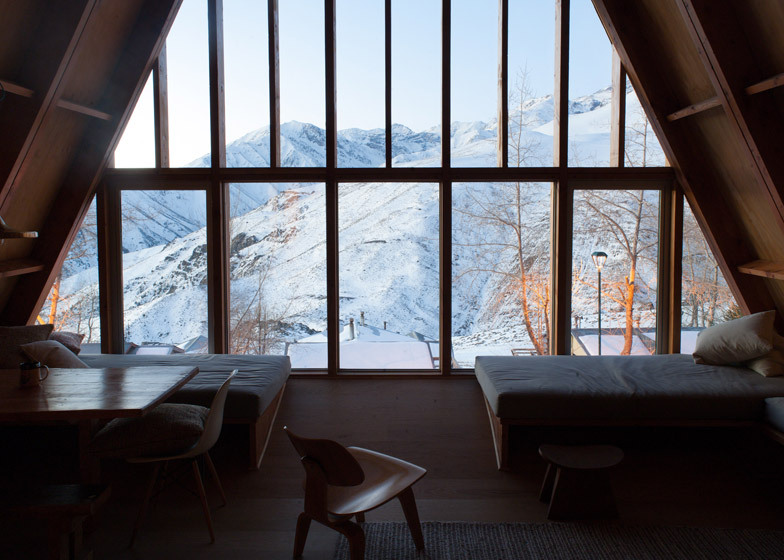 Views of the Andes are framed by the steeply pitched roof of this A-frame house, designed by Santiago studio DRAA for a Chilean ski resort (+ slideshow). 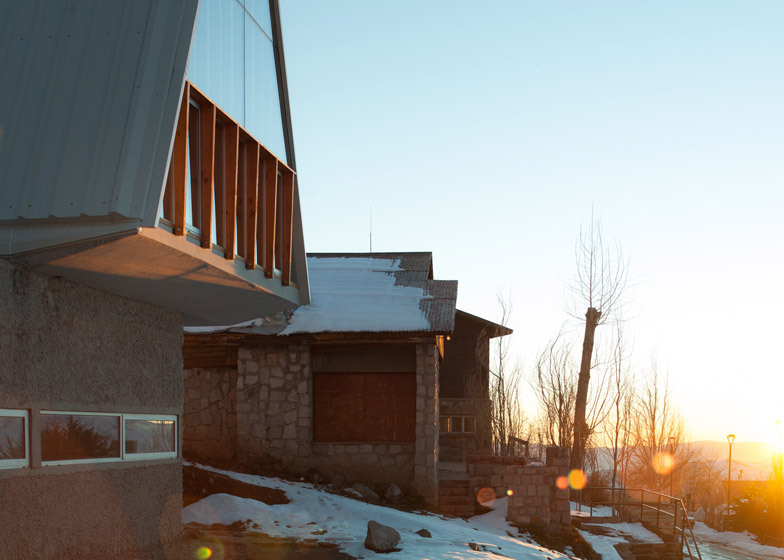 La Leonera Mountain Retreat was designed by Del Rio Arquitectos Asociados (DRAA) as a weekend house for a couple who head to the village of Farellones for skiing in the winter and mountain biking in summer. 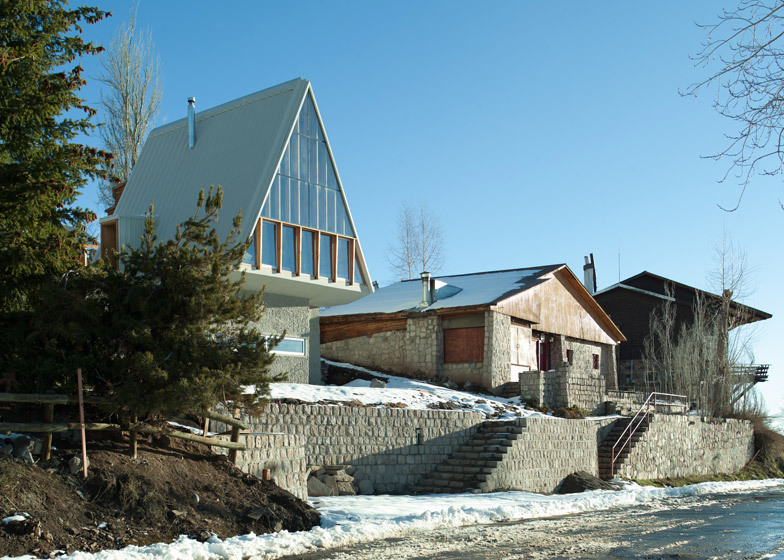 Basing their design on typical pitched roof properties found throughout the mountain region, the architects created a building that combines two distinctly separate geometric volumes – a solid rectangular base supporting a lighter triangular structure with a glazed facade. 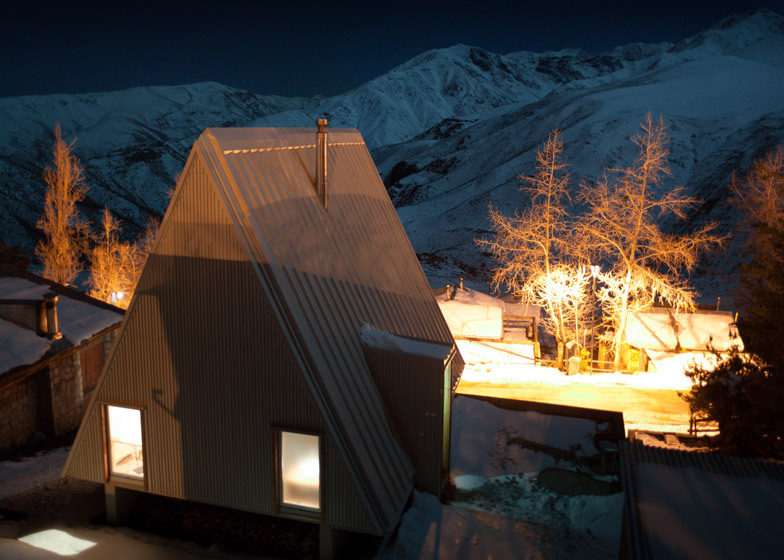 "The roof itself stands for a quintessential A-frame house, a classic in Chile," architect Nicolas del Rio told Dezeen. "However we made it pointier in search of a starker image and a loftier feeling inside." 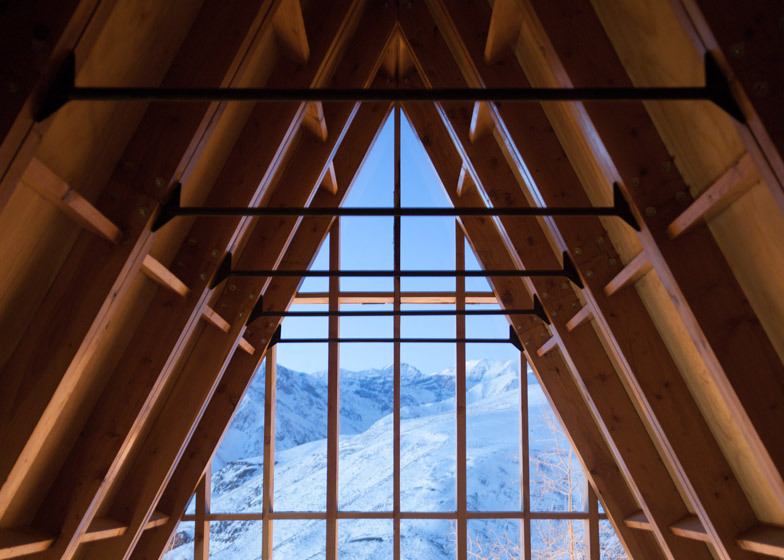 The A-frame structure is made from pine trusses covered by a sandwich panel of polyurethane with a zinc roof surface. Wooden buttresses interrupt the glazing to create a visual connection with the neighbouring building. The rough finish of the reinforced concrete base helps to ground the building in its earthy hillside site, while the structure above cantilevers out to enhance the sense of lightness. The cantilevered section shelters an entrance at the corner of the building that leads into a porch on the lower level. At the rear of the house, the roof is raised above the ground to create a gap beneath for storing logs. The base level accommodates a bedroom, a kitchenette and a space that can be used as a guest room. A wooden staircase at the rear of the building ascends to a living area dominated by the glazed facade that reaches up to the apex of the ceiling. Here, daybeds face out over the landscape. A doorway that projects out from the sloping roofline connects the living space with an external courtyard at this upper level. A bedroom and bathroom are positioned underneath the eaves at the rear of the property. 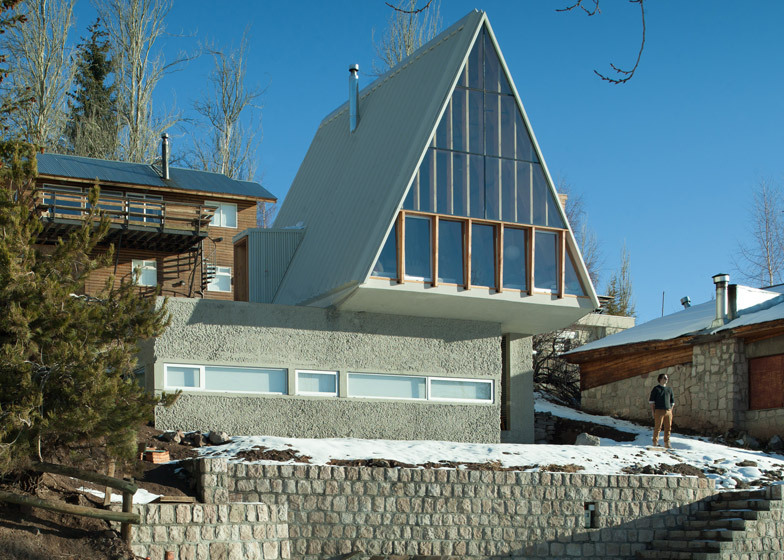 Nicolas del Rio previously operated a studio called dRN with architect Max Núñez. 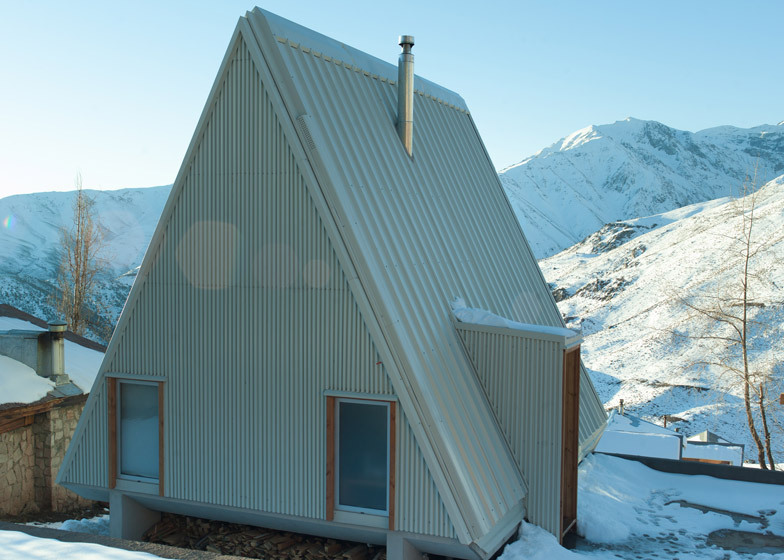 Their projects included a house on a Chilean island with a weathered-steel roof. Photography is by Felipe Camus.